Overview of the 2018 situation concerning selected SDG-related indicators. 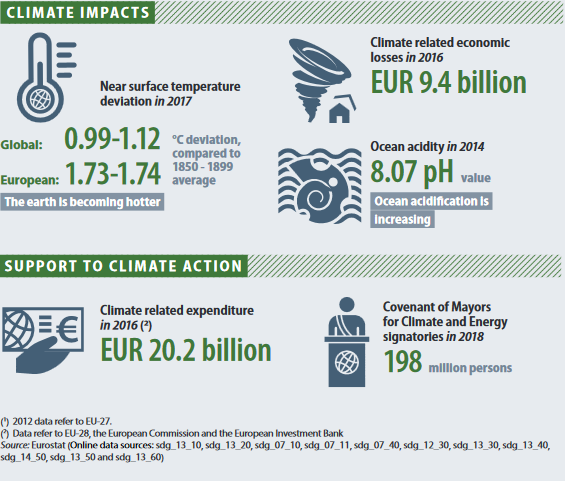 This brochure is a 'light' version of Eurostat's publication 'Sustainable development in the European Union – 2018 monitoring report on progress towards the SDGs in an EU context', conveying its main messages in a visual and concise way. The brochure provides an updated snapshot of the current situation concerning 100 indicators related to the 17 sustainable development goals (SDGs). It thus provides a snapshot of the key trends related to sustainable development in the European Union. Ecologic Institute's authors covered the chapters on SDG 2 (Zero Hunger), SDG 6 (Clean Water and Sanitation), SDG 7 (Affordable and Clean Energy), SDG 13 (Climate Action), SDG 14 (Life Below Water), SDG 15 (Life on Land) SDG 17 (Partnerships for the Goals). The publication is available for download. Bley, Simon Johannes, et al. (ed.) 2018: Sustainable Development in the European Union. Overview of Progress Towards the SDGs in an EU Context. Luxembourg: Publications Office of the European Union.